The ‘Market Street’ fruit and veg are kept really fresh by these wonderful cold mist jets. The boy was absolutely fascinated by them. The baby got a bit cold. 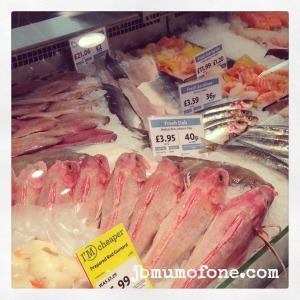 The range of fish and seafood on offer was impressive and Mr B was delighted. We picked up some cod for the recipe below. The cheese counter was equally impressive and it took literally ALL my willpower not to dive in and break my diet. 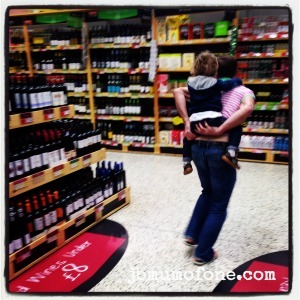 Mr B was rather excited by the wine selection. It was a truly good range and catered for all budgets with some really decent vintage wines at the £40 mark, and plenty for around £5. Having used up all my willpower at the cheese counter I picked up this cheeky red for £9.49. Our total shop, coming in at £81.17. And in amongst all of that is pretty much everything that you need for the following recipe, which is a slightly adapted version of a recipe from Tom Keridge’s Proper Pub Food. The cost of each ingredient from Morrisons can be found alongside, excluding the odd store cupboard ingredient that we had at home already. This recipe serves two and works out at approximately £4.52 per portion, whilst also stocking up the spice cupboard a little. Mix together the sea salt and saffron strands. Place a piece of cling film, large enough to wrap around the cod, on your work surface. Sprinkle half the salt mix onto this, place the cod on top before sprinkling the remaining mix on top of your fish. Wrap tightly and place this parcel into the fridge for 1.5 hours. Heat the olive oil in a large, flameproof, casserole dish over a medium heat. Add garlic, red chillies and onions and fry, stirring occasionally, for 6-8 minutes or until the onion has softened. Add the chorizo to the pot and continue frying for a further 5 minutes. Stir in the bay leaves, cinnamon stick, cumin and paprika and fry, stirring, for a further 3-4 minutes. Preheat the oven to 170ºC. Drain and rinse your chickpeas and add to the pot along with the can of tomatoes and chicken stock. Bring to the boil and then place in the oven for 45 minutes. Remove from the oven and taste the chickpeas. The sauce should have reduced and thickened a little. Season to taste. Rinse fish thoroughly in cold water and pat dry. Place on top of the chickpeas and replace the pot in the oven for a further 15 minutes or until the fish is cooked through and flakes easily. Remove from the oven. Gently take the fish from the pot and place on a serving plate. Remove the bay leaf and cinnamon stick before spooning your mix around the fish to serve. Disclosure: We were compensated with Morrison’s vouchers for the purpose of this post. It really is Donna and one of Mr B’s favourites. The Morrisons Mum thing has been really interesting hasn’t it? Ooh that looks delicious! Love Chorizo!! Me too. Wish it didn’t have quite so many calories though! I adore cod and chorizo together. One of our family favourites is cod, chorizo and olives, but i think I might give this a try too! Let me know what you think if you do. I hadn’t thought about adding olives. Interesting. 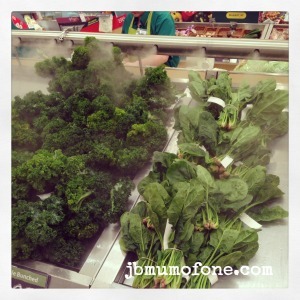 It really is fascinating seeing what people eat, and buy at the supermarket. So satisfying when you are nosy like me 😉 looks yummy! LOL I have found it really interesting too. I love getting glimpses of other peoples houses on their blogs too. Am very nosey. Thanks Helen. Hope you all had a good bank holiday. Your recipe sounds delicious and looks healthy too. I really like the fresh produce in Morrisons as they do make such an effort to present it carefully and the quality is good for the price. I wish that they did online deliveries as they are my local store but I am so out of the habit of having to go to the supermarket for a shop! The fresh produce was pretty amazing. They even had samphire which I have never seen in a supermarket before. Wow, that sounds awesome. Will be popping by to check it out. Ooo yummy, we do one like this regularly, with fennel and prawns in, a sort of Catalan fish stew. 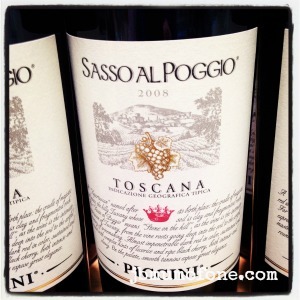 See now I am daydreaming about a bog bowl of this and a hunk of crusty bread! ooh lovely recipe – my lot lovefish so this would be devoured. 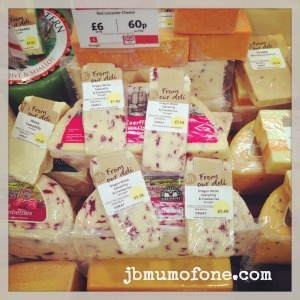 I am a cheese fan too – it is my downfall so I don’t have it often but really enjoy it when I do. Love the combinations in your recipe. 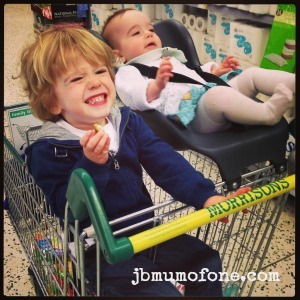 Commenting for myself @kateonthinice and on behalf of BritMums and thanking you for taking part. Ooo, this sounds delicious! I used chorizo with seafood before, like squid or prawns, but not fish. Definitely going to give this a go. 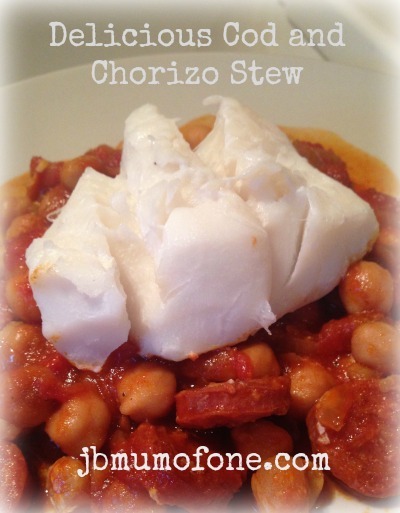 Never thought about combining cod with chorizo! It looks good and it sounds yum! Thank you for linking yup your recipe with #FridayFoodie!